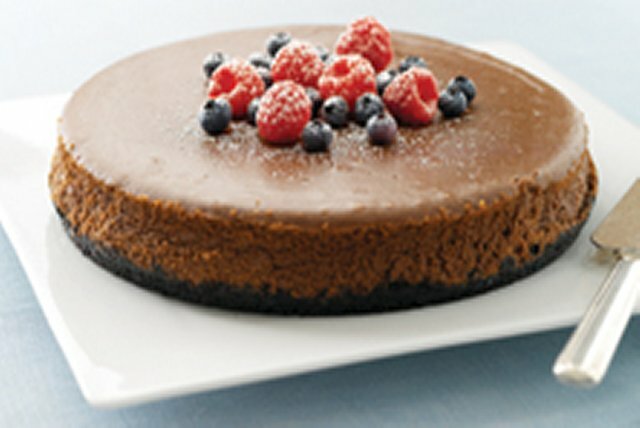 Take cheesecake to the next level with sleek and smooth chocolate. Mix baking crumbs and butter; press onto bottom of 9-inch springform pan. Beat cream cheese and granulated sugar in large bowl with mixer until blended. Add chocolate and liqueur; mix well. Add eggs, 1 at a time, mixing on low speed after each addition just until blended. Pour over crust. Bake 45 to 50 min. or until centre is almost set. Run knife around rim of pan to loosen cake; cool before removing rim. Refrigerate cheesecake 4 hours. Sprinkle icing sugar over cheesecake just before serving. Top with berries. Prepare as directed omitting the liqueur, and reducing the baking time to 40 min. or until centre of cheesecake is almost set. Since this indulgent cheesecake serves 18, it's the perfect dessert to serve at your next party.